Day three of tattoo recovery for me is the day that things stop feeling like sunburn and start feeling like dry, itchy skin. So that’s just a joy to deal with. Not that I’m bemoaning my quick healing powers, but the itching is no fun at all. We spent Frankie’s birthday having brunch, perusing used book stores, and buying video games. And then playing them until three in the morning. All in all, time well spent. Today there will be bowling. Which I will attempt despite my itching back and current inability to wear a bra in public. The things we do for love. Step 1: Resolve to get a thing done. Step 2: Start that thing and get a lot done. Step 3: Get distracted and wander off. Step 4: Count the days until the thing needs to be done. Step 5: Do the rest of the thing at the last possible moment. That is how moving has been. We have a bedroom full of boxes which are mostly books from the game room. But we haven’t done any packing since that first day. I mean, it’s good that that stuff is done, but we really need to buckle down and put things in boxes basically every night this week if we are going to avoid packing like maniacs the night before, which nobody wants to do. We certainly don’t want to be those people who pack while the movers are there. That’s unacceptable. 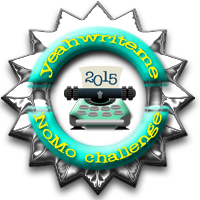 I’ve really been enjoying writing in my blog everyday for the NoMo challenge at Yeah Write. I hope you all have been happy to read what I’ve been putting out there. Some thoughts on Frankie’s birthday. You have just described my way of procrastinating. I hope your itching ends quickly! Now I want to go bowling – but you haven’t changed my mind about getting a tattoo!